iLuv has launched their latest iPhone Accessory for the 3G iPhone, the iMM173 Dual iPhone Dock Alarm Clock. This funky looking 3G iPhone accessory also works with the 2G iPhone and you can dock two devices at once, so if you had a 2G iPhone and a 3G iPhone you would be able to dock both. It is also compatible with all iPods, so you could dock you iPod and your iPhone at the same time. The iLuv iMM173 features an FM radio and a dual alarm, and you can chose to have the alarm play one of your docked gadgets, or the FM radio or the buzzer. There is also a built in sleep function, as well as a 3.5 mm audio jack so you could muse it with any other MP3 player as well. 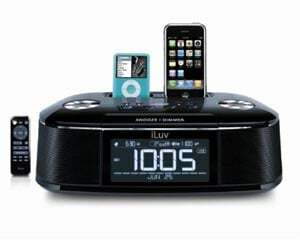 The iLuv Dual iPhone Dock Alarm clock is available to buy online for $129.99 from iLuv.